A lot of older games and software have received source ports over the years; furthermore, a lot of those older titles have had remakes or revisions that improve the underlying engine, adding features that were not available at the time the game was created. These capabilities tend to start with Source ports which add additional features, and sometimes a wild source port appears which is dedicated to introducing modern graphics features and/or high resolution textures. There tends to be two camps when it comes to the “best” way to replay these older games. There are those who argue that these modern source ports “aren’t the way the game was intended to be” and violate a sacrosanct code of ethics regarding playing games, and there are those who think if you can make something look or play better, why not. I fall largely into the latter camp. My logic is that if the capability had been there then the games were more likely to have the enhanced capabilities that we find in source ports, and the lack thereof isn’t a direct indicator of those aspects going directly against design intentions. Furthermore, I reason that if we go down that route about “intent” then we should be forcing many of these games to run in very low resolutions or to struggle with low framerates, in order to match the typical system capabilities of the era. A few specific titles come to mind when it comes to these sorts of titles. There are plenty of source ports and configurability that allows players to be “pure” and entirely consistent with the original titles, as well as those which appeal to those who want to replay the game with a bit more flair. Doom running via the “Chocolate Doom” Source port. textures and there are even Models that you can use to replace all sprites in the games. 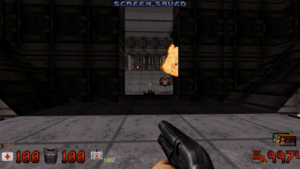 Traditionalists haven’t been left out; Chocolate Doom is a source port that runs on pretty much any platform- even MS-DOS itself- which seeks to keep the gameplay as original as possible. One thing I’ve noticed in particular is that it seems to have it’s own OPL3 Based Music synthesizer built in, whereas other source ports use the system MIDI synth. 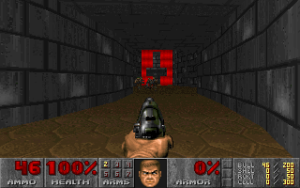 I’m personally partial to Project Brutality via gzDoom, myself, as I feel it makes playthroughs more interesting and unpredictable because of new, unique enemies and weapons as well as enemy and pickup randomization. I also like to use a tweaked version of Oblige, ObHack, which is a WAD generator which I then modified (the LUA scripts) even further to increase enemy, ammo, and health amounts to ridiculous degrees, though that’s not really here or there. 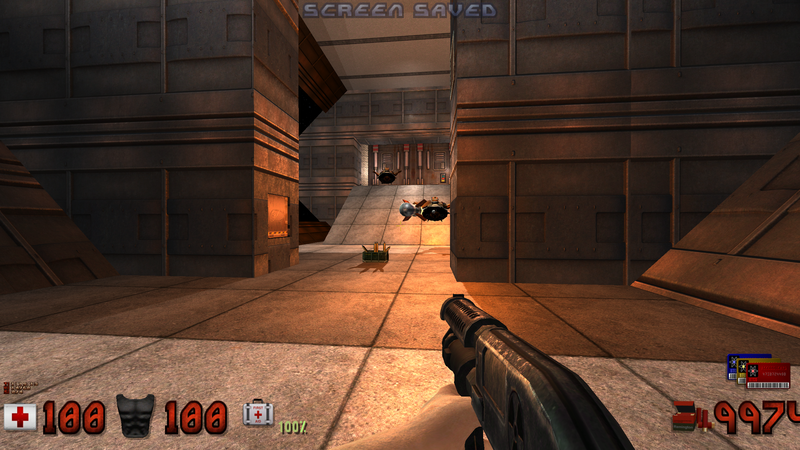 Duke nukem 3D, via eDuke32, using the Polymer Renderer and High resolution pack. 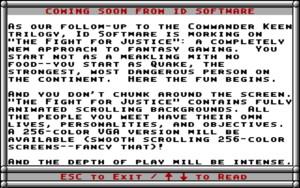 the Atomic Edition) and several unofficial add-ons such as “Duke it out in D.C”; Like Doom, it also had a vibrant community of level creators, kickstarted, somewhat, by the original CD including the Level Editor, BUILD. 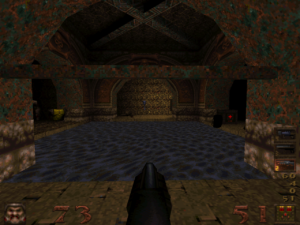 It has it’s own share of Source ports, but unlike Doom, there is one that stands head and shoulders about the rest- eDuke32. This port has pretty much any feature you could possibly want; including a brand new 3-D Renderer that allows for not only high resolution textures and models, but features like dynamic lighting, models, and various new image maps like normal and bump maps being supported. 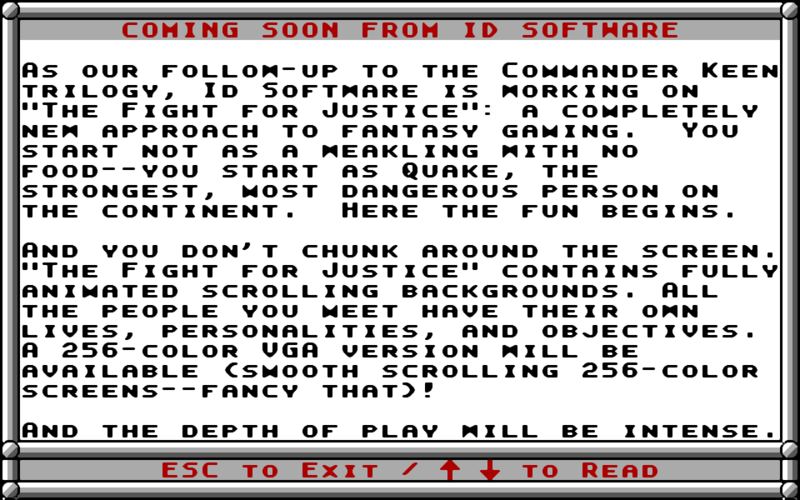 The “Quake Preview”, then called “A Fight for Justice” found in Commander Keen, Episode 2. Quake as seen via the relatively faithful Makaqu source port. the same location in-game as seen in the enhanced Darkplaces Source Port. capabilities were rather ground-breaking. While the DOS game normally used CPU-based Software rendering, paired with support for VESA standard resolution support, You could also get a version which used OpenGL, (or even a variant which internally converted OpenGL calls to Glide for those users with 3DFX Cards). 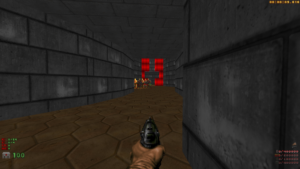 Quake, Like Doom, was eventually Open Sourced. 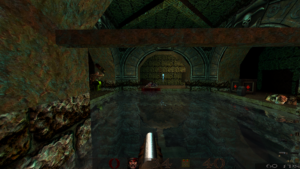 as a result of this, it, too, has seen innumerable “Source ports”; from egoboosting <name>quake.exe versions where people just slap their screenname or first name in front and add a few features, to full-fledged, complete reworks of the base engine. I’m particular to Darkplaces myself. This was actually part of what spawned this entire post, which is that when I posted a screenshot of Darkplaces with “all the trimmings” it was met with some lukewarm responses about how that “isn’t how it is intended”; Naturally, their recommendation for the “proper” way to play was another source port, which I think I’d most liken to Chocolate Doom, Makaqu. Quake, a game about fighting interdimensional demon hordes, naturally spawned a sequel where you play the role of a space marine in a retaliatory attack against an Alien race. Alright, so it wasn’t really a sequel in anything but name. Even so, the gameplay is very similar. A scene from Quake 2’s original released product. And, we see much the same “aftermarket” support appear long after the game had fell from the public eye. 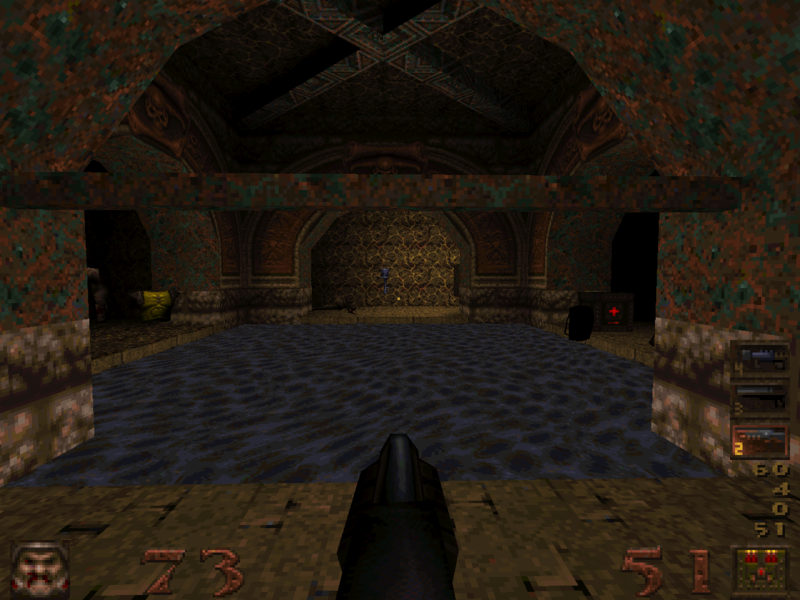 One can find enhanced source ports with dynamic lighting and even high resolution texture packs available for it, such as Quake2XP, r1q2, Berserkerq2. modern systems. A lot of older games that were held onto more closely by their manufacturers require very specific hardware configurations and setups, or have compatibility issues. This presents a problem for playing those titles today without actually procuring a system built specifically towards those title’s particular limitations. 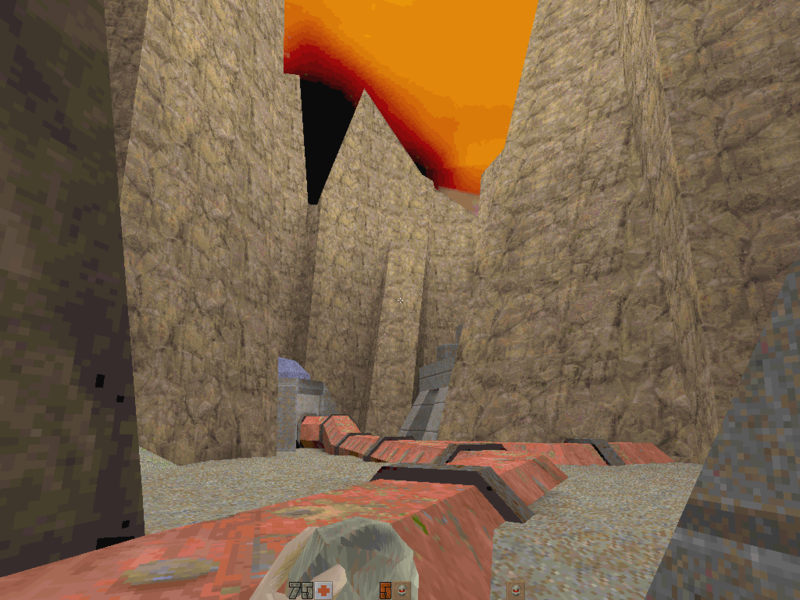 Open Sourced commercial games of “yesteryear” means that people who want to give the game a replay on their new PC can play it without major compatibility concerns as well as crank visuals to 11 if they so desire. 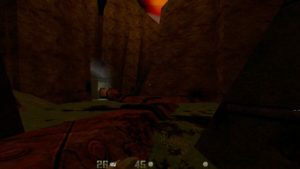 The same scene seen in Quake2XP’s enhanced engine.